Biola University’s Music in Worship program released their first CD this fall, composed of songs written and performed by students, faculty and guest recording artist, Tommy Walker. “We have some really gifted students into songwriting,” said music professor Jeff Askew who spearheaded the project. 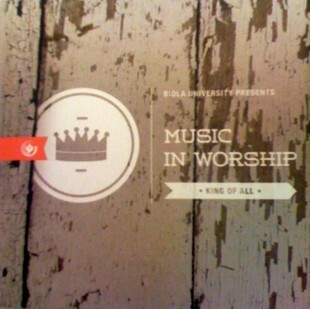 The CD “Music in Worship: King of All” was created to highlight the work happening in the music in worship department. Thirteen students, three faculty members — Jeff Askew, Rique Pantoja and Dave Owens — and one alumnus were featured on the recording. The project also features guest recording artist Tommy Walker, a well-known singer songwriter from the Southern California area. Annually, Walker invites students in the program to join him in a choir leading worship at his church, Christian Assembly in Eagle Rock. “Tommy is an established guy who is a good crossover artist,” said Askew. Bass player Norm Stockton, who currently tours with Lincoln Brewster, is also on the recording. The majority of the project was recorded and mixed by S1 Studios in Fullerton, Calif. Pre-production began in February 2012 and the recording was completed by mid-summer. The department hopes to produce additional CDs in the future and continue to partner with additional artists. The CDs will showcase the work of current students in the program. The music in worship program started in the Fall of 2004 and has grown to approximately 55 students. The program offers classes such as songwriting, designing and leading worship, music theory, music technology and sound production, sight singing and dictation, and pop theory for contemporary worship. The CD is currently available for purchase at the Conservatory of Music office and will soon be available on iTunes. Did biola help the artist produce the record...like did the students participate in the recording/audio engineering? I recently wrote a piece on <a href="http://www.2infamous4you.net/going-to-school-for-music-production-and-audio-engineering-is-it-worth-it/">going to school for music production and audio engineering</a>, and started checking out some of the schools besides the popular big names that are overpriced (like fullsail).